Jeff Matthews agreed to join us as a full-time member of the group and in January 1971 we went into Lansdowne Studios to record our second album. We included three songs that we had started earlier with Tony – ‘Sad Fisherman’, ‘Jennifer No One’ and ‘Butterfly Catcher’, as well as a new song by him, ‘Celestina’, with John singing lead. Without Tony playing guitar, we were able to experiment more with our sound. The arranger Lew Warburton was brought in to oversee the rhythm sections and we booked top session musicians such as Clem Cattini on drums, Herbie Flowers on bass, Roger Coulam on keyboards and Chris Spedding on electric guitar. We recorded four of my songs, ‘Tomorrow Is So Far Away’, with a wonderful guitar solo by Jeff, ‘Ladybird Don’t Fly’, ‘Love Is’ and ‘The Time Has Come’. The latter was again about my ex-girlfriend, and the soaring string arrangement by Syd Dale brought a tear to my eye when I first heard it in the studio. ‘Strawberry Fields Forever’ was one of the earliest songs we had learned as a group and it is a good example of how we liked to use our voices as instruments. ‘Man We Was Lonely’ was taken from Paul McCartney’s first solo album McCartney, and I believe we were the first artists in the world to cover the song. 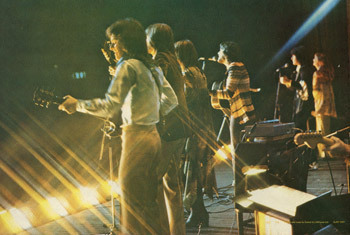 It featured just the six of us, with all the guitars being played by Jeff, and the percussion by John. The final session was arranged by Alan Parker, the guitarist from Blue Mink, and was a major change of direction for us. We had been given an advance pressing of an album by an American vocal group called The Groop. We knew nothing about them but we loved ‘The Jet Song’, written by Chris Ducey of The Penny Arkade. It involved a totally different vocal style for us, with the girls singing an octave lower instead of their normal soprano. The other track was the excellent ‘Take A Boat’, our first recording of a song written by John. Now came the pivotal moment in our career. John Coast arranged an audition for us with John Ammonds, the producer of The Morecambe and Wise Show on BBC television. This was the most popular TV show in the UK. We sang him several of our own songs but he insisted that we had to perform one that was already well known, and he chose our arrangement of ‘Sunny’ by Bobby Hebb. We could have refused but it was hard to turn down such a popular show. We had an album to promote and we knew it would give us nationwide exposure, which it did, but it also branded us as ‘family entertainers’. We went on to appear on more than fifty television shows but it would take us a long way from our folk-rock roots and in a completely different musical direction. At the same time we released ‘Jet Song’ as our second single, but it received hardly any airplay. It was a major disappointment. 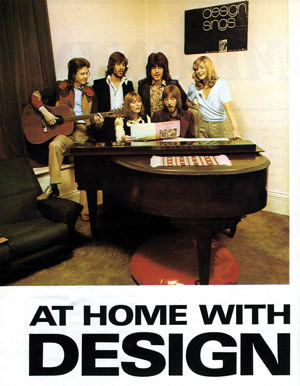 A couple of years later I heard Tony Blackburn play the single on his radio show with the comment, ‘That’s Design. Why don’t they make records like that anymore?’ The answer was that nobody would play it at the time! Fortunately, ATV liked our album and booked us for a series of six Sunday night television shows called Songs That Matter. 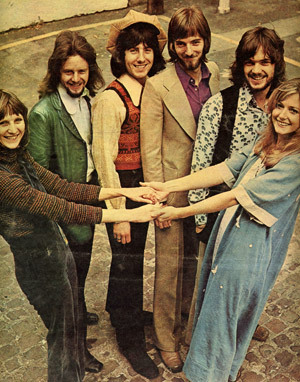 We had to choose songs with a religious connection and they came in useful when we were invited to be the choir at the wedding of Melody Maker journalist Mark Plummer and the singer Christine Harwood. The organist was Rick Wakeman of Yes. Later that year we were the backing singers on Christine’s debut album Nice To Meet Miss Christine, which has now become a collector’s item. In August we made our first professional stage appearance in the UK with Rolf Harris in Bournemouth, billed as ‘Television’s new sensational vocal group’. All this exposure persuaded CBS to release our second album in the UK. The title was Tomorrow Is So Far Away and we were finally able to use John Ireland’s cover artwork from the first album. Then the blow fell. CBS suddenly discovered that our contract with Epic in the USA was about to expire. The head of CBS in London had never liked the fact that we had signed direct with the American company and he refused to renew our contract. ‘Love Is’ was bubbling under the charts. We pleaded with the A & R department but they were told to stop work on Design instantly. I was told, ‘That’s it’…and it was. 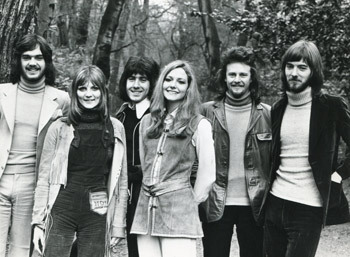 All promotion stopped and within a couple of weeks the single had disappeared from the radio. It was the closest we ever came to getting a hit record. At the time, of course, we did not know that. As far as we were concerned, the future was still looking bright. We started 1972 with mixed fortunes. On 14 January we signed a long term contract with EMI Records and Peter Jones, editor of the Record Mirror, tipped us as the group destined for stardom in 1972. He wrote: ‘I’m a Fifth Dimension fan, but my belief is that Design get deeper than the Americans into the world of voice-matching, scene-switching brilliance. Quite simply they make beautiful sounds. We’re just about ready for them.’ Soon afterwards we released our fourth single ‘Colour All The World’ but it failed to enter the charts. We decided it was time to move on from the acoustic guitars and folk-rock sound of our first two albums and we asked Herbie Flowers, the bass guitarist from Blue Mink, to arrange the rhythm sections for our next album. We began recording in February at Lansdowne Studios in London, with a percussive arrangement of ‘I Feel The Earth Move’ by Carole King, from her album Tapestry, and three new songs written by John – ‘Meet My Friends’, ‘Yellow Bird (Have You No Home)’, and the magnificent ‘Nature’s Children’, with a mesmerizing lead vocal by John. We also included a new song by Tony Smith, ‘Fallen Angel’, sung beautifully by Gabrielle, and three songs of mine, ‘Can This Be Love’, a sensitive solo performance by Kathy, ‘If You Think About Me’, and ‘When Morning Comes’, featuring some dynamic electric guitar from Chris Spedding. We did not ignore our folk-rock roots altogether and recorded ‘Pisces Hymn’, a stunning choral piece with multiple harmonies by Dave Shannon of the folk band Therapy, as well as our version of ‘You’d Better Believe It’ by folk legend Tom Paxton and Ed Welch, and the title track, ‘Day of the Fox’, a brilliant traditional-style folk song written and sung by Geoff Ramseyer. In March we were voted 19th best Mixed Group in the world by readers of Record Mirror. We were amused to learn that we had received only three votes less than Wings and five more than Sonny and Cher! A month later we made our London debut in cabaret at the Savoy Hotel. On the day we opened at ‘London’s top people’s nightspot’ Gabrielle was pictured on the front page of the Sun newspaper, but during rehearsals we were asked to leave the Savoy coffee lounge because we were not wearing ties. Later that evening (still without ties) we appeared on the stage and the critics applauded our ‘shining brand of youthful exuberance’ and ‘infectious enjoyment’. On 21 July 1972 we released our fifth single, ‘Mayday’. This was written by Herbie Flowers and Sandie Shaw and was a twenties-style number we had recorded for the album as a bit of fun. We were surprised when it was chosen by EMI as the single, but television producers loved it and we sang it on several TV shows including Morecambe and Wise and Sez Les. However Radio One gave it the thumbs down and one reviewer described it as having ‘too much gimmickry’. It became one of the most popular songs in our live act, because it was so catchy, but it seemed we were further away than ever from that elusive hit. We continued to appear frequently on television and in the cabaret clubs around the country and in the autumn we were booked as the supporting act on Gilbert O’Sullivan’s first nationwide tour. Gilbert was then number one in the UK charts with ‘Clair’ so the tour was sold out instantly. It started on 31 October at the National Theatre in Dublin and most of the reviews were complimentary, apart from Charles Shaar Murray in the New Musical Express, who wrote: ‘Also on were Design, who took a perverse pleasure in massacring such good songs as "Eli’s Coming", "Strawberry Fields Forever" and "My Sweet Lord"S. Awful, awful, awful.’ I don’t think he liked us very much!